Infant Resuscitator with Oxygen Blender is mainly used in delivery room, baby wards, NICU. Infant Resuscitator has inside alarm system for differential pressure. When alarming the safety valve starts automatically and produces the mixture gas continuously to ensure the safety of baby. Feature to adjust the Oxygen concentration from 21% to 100%. The range of flow adjustment is 5LPM~15LPM. MAX-P and PlP are safe, controlled and accurate. This product is very simple to operate and flexible. Pressure gauge :- 2~10 Kpa (-20~100cm H2O). MAX-P : 0~15 LPM 6 Kpa (60cm H2O). PIP : 5~15 LPM 0.2~5.7Kpa (2~57cm H2O). PEEP : 5~15 LPM 0.03~2.3kPa (0.3~23cm H2O). It comes with inbuilt Air/Oxygen Blender. 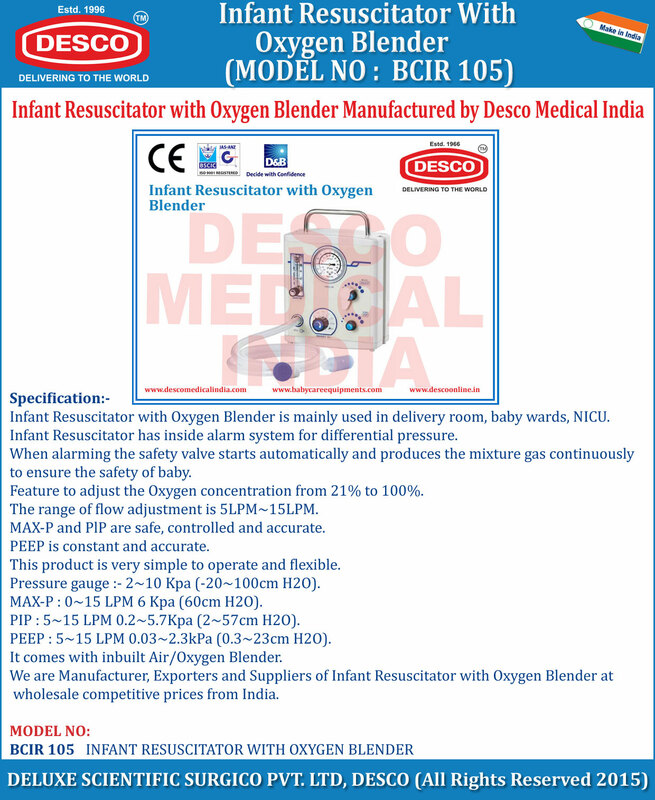 We are Manufacturer, Exporters and Suppliers of Infant Resuscitator with Oxygen Blender at wholesale competitive prices from India.